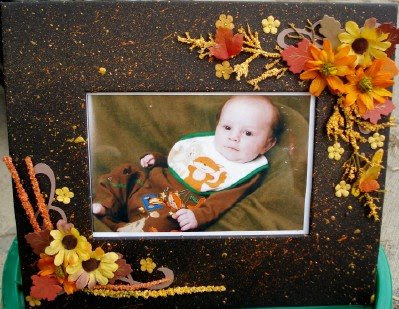 Description: I made this frame for my aunt as a gift. It is Dusty at 7 weeks old in a little fall outfit. I splattered painted the frame then used the cricut home accents for flourish and then used dollar tree pics and tiny prima, the rhinestones in the tiny prima. SHE LOVED IT! !